When Dark Legacy appeared in the Fear Finder and Haunt Guide last fall with full page advertisements it was clear that somebody wasn’t playing around. The mysterious haunted attraction was new to the Detroit scene but all indicators suggested that it was being organized and operated by anything but a rookie. Located in Wixom, Michigan, Dark Legacy featured three haunted attractions — Government Owned Haunt, Kensington Detention Center and Fang Cemetery. Each leg of Dark Legacy was intricately detailed and appropriately styled to match a specific theme but the true strength here was that the journey through Michigan’s newest haunt told a single, continuous story. John and I made the trip out to Wixom on Devil’s Night and when we arrived enjoyed a conversation with owner Austin Denney and various members of his staff. They were each enthusiastic and knowledgable about their respective roles and positions within the hierarchy of Dark Legacy; a few of them even seemed intrigued by our travels throughout the state and lands behind in our never ending chase for screams. As John and I would soon learn, our trek through Dark Legacy would become another memorable entry in our book of horrors. The fun began in the queue area which had been fitted with prop steel girders that had been expertly distressed to create an authentic aged industrial appearance. The look set the stage well for the quasi-military research facility known simply as Government Owned Haunt. This area was dominated by large rooms and the elaborate props that had been thoughtfully selected and placed within them. One area contained an impressive security control panel flush with monitors, switches and buttons. Another room contained a series of cages which held shrieking, thrashing animatronic monkeys and yet another laboratory saw us witness the electrocution of a tall zombie. His limbs flopped and flapped as the electricity coursed through his rotting body and then suddenly the contraption spun violently and revealed a hidden chamber from which a live actor sprung and chased us from the room. Elsewhere, there was a strange doctor with alien specimens followed by an eye-catching hallway that featured a sliding floor and a series of dancing lasers. Amidst such eye candy it might come as a surprise that the most memorable moment inside Government Owned Haunt occurred in a very small room that was humbly decorated with a simple chair and small, floor model television. Static filled the screen for a moment but then a shape began to emerge from the white noise, a human face forced itself from the snow-driven abyss! John and I were bewildered and observed the phenomenon from various angles as a way to test the merit of the illusion. Shockingly, no matter the angle the bizarre head pushed forward from the television set. It was an awesome sight and something John and I have witnessed exactly once in all of our haunted house adventures. We exited Government Owned Haunt and found ourselves in an alley complete with dumpster and one fetid creature who mindlessly pushed a shopping cart. This area served as a transitional one and was smartly designed to maintain continuity while it guided customers from Government Owned Haunt to Kensington Detention Center. Kensington Detention Center, like Government Owned Haunt before it, offered immersive scenes that transported guests to a defunct facility where all manner of experiments had been conducted on the hapless souls trapped within the walls. John and I would have the pleasure of meeting several of those hapless souls as we traversed Kensington’s haunted halls. One of the most animated characters came in the form of a small woman who wore a medical gown and had recently lost an eye. There was a metallic instrument clutched in one of her hands and as we interacted with this excitable patient it became apparent that she had likely performed the grisly surgery herself! It wasn’t long before she intimated that she’d love nothing more than to add one of our peepers to her collection. Kensington Detention Center also showcased several props with integrated video elements and without a doubt the most exciting of the bunch was a shipping crate that had been chained to the ground and bore the words: Biohazard. The wooden box rocked back and forth as if something on the inside violently thrashed for freedom. A window near the top of the box afforded us a view into the interior and as we peered into the unknown a monstrous face suddenly appeared in the window etched with rage and anguish. Soon thereafter, we traveled through a morgue and then entered the hallowed grounds of Fang Cemetery. The cemetery was highlighted by an imposing series of catacombs and an awesome graveyard scene that utilized an explosion of light, sound and movement to deliver a heart-pounding jump scare when a stone gargoyle suddenly turned animate and disrupted our progress. When we emerged from Dark Legacy I noted that the haunted expedition had chewed up roughly 25 minutes — a length that easily surpassed the average haunted attraction. The triple threat spook house managed to avoid the pitfall of rushing guests through at a break-neck pace but also made sure to eliminate any energy-sucking dead spots. The attention to detail cannot be understated; each room was decorated with a wealth of props, animatronics and other set decor that enhanced the atmosphere and reinforced the overall illusion of a haunted attraction. The cast was an above average one punctuated by a few standouts who served the narrative of Dark Legacy quite well. And enough cannot be said about the flow from one attraction to the next — too often this is an overlooked or neglected aspect of a haunted attraction and when done poorly can break the spell operators work so hard create. We’re also big supporters of the growing trend of the use of so-called actor-matronics, the hybrid of live actors and animatronic costumes. In my mind this isn’t just limited to actors wearing this style of costume but can also include instances of actors delivering a scare alongside an animatronic. Dark Legacy put this practice to use on at least two occasions — first when we encountered the electrified zombie and then later when we crossed paths with a hulking robot of sorts who gave us quite the surprise indeed. In some ways Dark Legacy put me in mind of House of the Dead at Terror Town but that isn’t to suggest that the team here isn’t carving out a unique identity. Dark Legacy opened the haunted toolbox and built an attraction that utilized all of the tools and techniques that make a haunted house fun and exciting. It was a hell of a foundation that Dark Legacy laid out in 2014 which should only lend itself to future success. On Devil’s Night 2013, we visited a rookie haunted attraction located in Westland, Michigan known simply as Hush. The experience was a memorable one and Hush would go on to be named the 2013 Horrorlust Haunt of the Year. As fate would have it, we would return one year to the day and test our will against Dr. Phineas Phun and his creations at the Hush Corporation. We approached the front doors and were soon reacquainted with the madman of malpractice, the aforementioned Dr. Phineas Phun. It would seem that the good doctor doesn’t forget a face because he instantly recognized John and I and immediately he launched into suggestive quips and darkly playful banter. As Dr. Phun toyed with us as a cat does a mouse, I noticed to our left a second man who was dressed in a medical coat. He was tall with long black hair and sported a child-like smile; he waved repeatedly and eyed us stupidly. Dr. Phun noted the exchange and introduced us to his rather special brother, Phileas Phun. Phileas seemed docile and even friendly, but prior experience had taught me not to trust a member of the Phun family — just how many offspring had Momma Phun produced anyway? I wouldn’t have time to ponder the thought further as the Phun Brothers bade us an ominous farewell and ushered us into the Hush Corporation. John and I found ourselves in a small but sleek reception area, a short secretary approached us from behind a desk and began to explain the cutting edge scientific experimentation performed at the Hush Corporation. There was an alien sheen to her hair and her face was marked with curious, phosphorescent symbols. However, it was her words that were strangest of all — she spoke in a clear and direct manner but her cadence was stilted. Her words and sentences possessed no flow, no soul. It was as if she were merely reading from a script, emotionless. It was almost as if the very words coming out of her mouth had been programmed. She asked no questions and gave no indication she regarded us with anything other than cold indifference. She had made her way to a door opposite the desk and with cocked, twitching head she began to repeat the same phrase over and over and over. John and I took this as our cue to exit before she turned into an angry android. We wandered the darkened halls of the Hush Corporation dodging booby traps and lurking critters; we steeled our nerves when made to pass an incinerator complete with glowing embers, heat and steam. Shortly, we had descended into an elaborate sewer system where pipes carried the runoff of all manner of foulness being conducted at the shadowy Hush Corporation. As we crept and ducked our way through the labrythine pipes, a writhing, hunched creature hunted us from the dank shadows. As the repellant monstrosity slunk through shafts of light I caught a momentarily glimpse of its grotesque face. It put me strongly in mind of the sewer-dwelling Flukeman that Agents Mulder and Scully once confronted in an episode of The X-Files. Moments later we encountered a bald, middle-aged doctor who had been confined to a steel cage that appeared to be suspended above a dark waterway. Our sudden presence seemed to excite him; he flapped his hands and attempted to reach out to us all while he cooed and made other silly sounds. Why had this doctor been locked inside of a cage in the sewer system? Was he a would be whistleblower who attempted to expose the Hush Corporation? Was this another member of the Phun family? Would he and his steel prison plummet to a watery grave? John and I had no time to ponder such questions, pursued by a mutant toilet monster as we were. We soon emerged from the musty atmosphere of the sewer system and found ourselves once again surrounded by the inner workings of the Hush Corporation. We turned a corner and spotted what appeared to be the kind of large display case one would expect to see at a zoo. A pair of male patients, or more accurately specimens, were going absolutely bonkers inside the enclosure. The duo pulled at their hair, pounded the glass with their fists and issued primal screams as if under persistent psychological torture. Rage and lunacy danced wildly in their eyes and quite suddenly one of the pair attempted to escape the cage by climbing through a narrow opening in the ceiling. When he failed in his bid to escape he utilized his new perch to violently grab hold of and strangle his cellmate. Next, we entered a brightly-lit medical laboratory and immediately heard the opening notes of a familiar nursery rhyme. A petite, attractive blonde dressed in a lab coat moved jerkily toward an operating table and in her hand was a large needle. Upon the slab was a slumped cadaver and as we processed the scene, the sinister songstress theatrically thrust the needle into the stiff. The injection revitalized the corpse and in an instant, John and I found ourselves being stalked by both the reanimate and Dr. Blondie. We didn’t fancy ourselves as just another victim of the Hush Corporation and therefore took our leave of the two. In fact, as we fled the scene we transitioned into an outdoor area filled with crates and shipping containers. We hadn’t made it far before we’d attracted the attention of several pint-sized monsters who were briskly intercepted by armed guards. The guards vocally rushed us forward and as John and I plowed onward the tail of Hush orphans seemed to swell in our wake. Through undoubtedly unpleasant means the team of mercenaries kept the Hushies at bay which afforded John and I one last demonstration from a staff member of the Hush Corporation. We happened upon a large containment chamber, through a window was visible the ugly mug of a beastly specimen in suspended animation. A tall, lean female scientist stood beside the cryogenic apparatus and instantly began to recite a litany of facts and figures about the technology employed by the Hush Corporation. She bore many of the physical hallmarks displayed by the cyborg receptionist we’d encountered at the beginning of our journey but she did seem knowledgeable and confident about her work on this particular project. My eyes darted from her to the frosty fellow inside the chamber. Had I just saw it blink? Was the equipment about to malfunction?! Just as she reassured us of the stability of the machinery, the cryogenic freak lurched forward and secured a meaty paw around the throat of our loquacious host. Once again, armed guards descended upon the area shouting orders and brandishing weapons. And with that John and I were swept from the Hush Corporation, fortunate to have survived unscathed. Too often, upstart haunted attractions suffer from a sophomore slump but such was not the case at Hush in 2014. The team manufactured an eye-catching new facade, implemented a series of expertly detailed and highly immersive scenes and skillfully executed several special effects which all served to engineer a complete overhaul of the show. Hush was well-paced, stuck to a theme, told an enjoyable story and the most talented actors were smartly saved for key sequences. 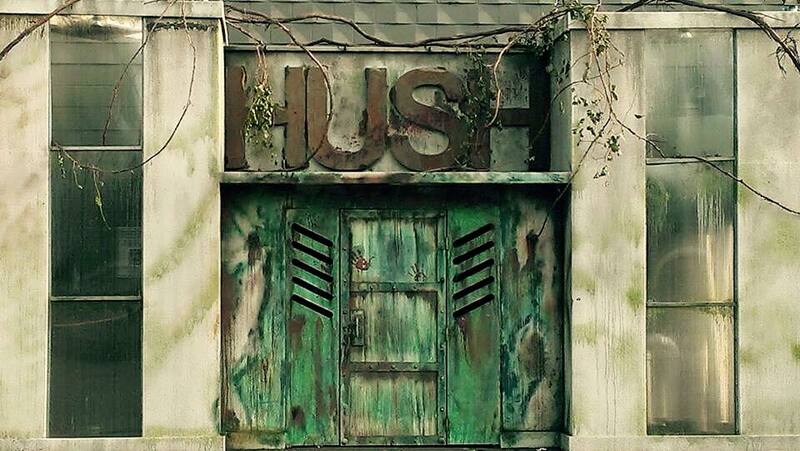 The team behind Hush is young, ambitious and has accomplished a lot on the Michigan haunt scene in just two years. I look forward to the future evolution of Hush Haunted House.